I'm back with the last video in the Paisley Series. Love it! Could you please ask your mom for the directions to make the little flowers so that I can ask my mom to make me some? Thanks. That would be lovely for a bride that is using black and white as her colors. This card is great. You can use it in so many ways. I love this card! The bit of red is just right. I'm loving the new series. Thank you!! WOW!!! I love the umbrella card. gorgeous as always! I really need this cartridge lol! And those flowers are so cute! Your mom should sell em! Such a cute simple card! You did it again!! Gorgeous! Simple yet classy I love your cards! Thanks for sharing your creativity with us...your cards are so awesome! PS Thanks for the signature music I love it it fills me with anticipation to watch your video and she your latest creation! Such an adorable card, Christina! I love the black and ivory combo, too! Thanks for sharing! 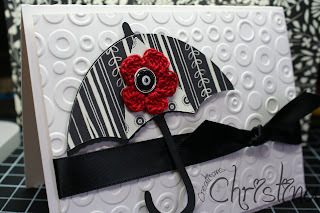 What an elegant card and the black/ivory works so well together with the red flower - excellent choice of colors. I have to get the paisley cart. - would make an adorable baby shower card too. Thanks!! This card is absolutely gorgeous!!! Can't wait to try it! I love this card. It is going on a favorite list! The colors are smashing. Love this card and your choice of colours. I LOVE this card! It's just perfect! I love the colors, thanks for sharing the paisley cart with us! Great card! I just got the Paisley cart today so I will give this a try. Thanks. Love this card! It is too cute! 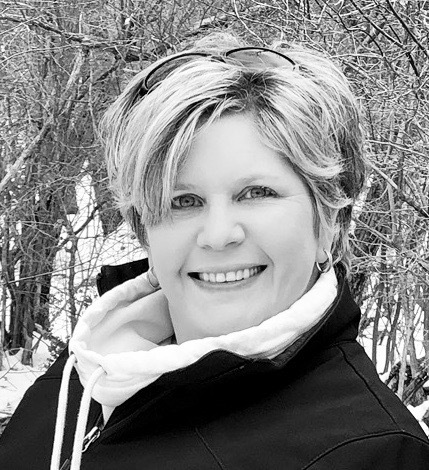 Jeannette M.
Really really nice Christina! I'm getting really super tempted to go out and buy this one!! Love this car it came out realy cute. I love the black and white with just a splash of red. Love, love, love this card!! Thanks for sharing. I so want this cartridge. Love the black and white...the red flower adds the special touch. Thanx for another wonderful video Christina ... I love the monotone colors on this of the black and white ... the splash of red from the flower is the perfect accent. Love this card ... easy to make, but looks fabulous! Great job! Very elegant card. I will be making this card, I have the cartridge and the embossing folder, so I am all ready to go!! I love the black and white together as a creates a whimsical yet elegant card! Now I want to go out and buy that longed for Cuttlebug so I can emboss for the same effects! I love how you are doing the videos now. The finished cards are fantastic. Thanks. Really liked this card. The little red crochet flower was the perfect touch. I would love directions on how your mother makes the flowers...please!! :0) Your card is so cute and the red just adds the perfect touch. Thank you for your videos I LOVE them!! The cuttlebug embossing really made the card pop. Great idea as always! Very SWEET card and CLEAR tutorial! Thanks for the opportunity to win the Pink Stamper DVD! So easy, but it looks like so much more. Love it! Christina! This just turned out soooooo pretty and elegant. I absolutely LOVE it!!! This is my first time to visit your blog. I ordered the Paisley cartridge today and have been looking around for different ideas to use it. Thanks for such a cute card idea!! Such a simple beautiful card. Love your tutorials. Thanks for sharing this video. Such a gorgeous card and the paper is wonderful. A very great card to use for so many things! !